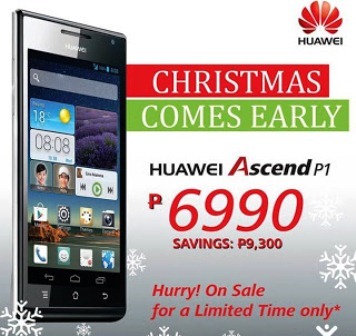 A big blowout from Huawei, since Christmas is almost there, Huawei mobile has just announced a huge price drop, or rather a early Christmas sale on Huawei Ascend P1, from Php16,200 to Php6,990 (save Php9,300). The price cut of Huawei Ascend P1 is more than half of its original price, and the sale will last until August 30, 2013 to September 8, 2013. The early Christmas sale will only last 9 days, after that back to its original price. Considering that huge amount, you can even spare the money to buy another gadget, a true Christmas bonus for Huawei patronizers. The Huawei Ascend P1 boost 1.5GHz dual-core TI OMAP 4460 processor, a Super AMOLED display with 256 pixel density, covered with Corning Gorilla Glass 2, 8MP auto-focus BSI camera with DUAL LED flash, and 7.7mm slim body. So far those are the main features of Huawei Ascend P1. Previous price of Huawei Ascend P1 is Php16,200 now only Php6,990 in the Philippines, on selected stores, which we will list below. The promo runs only from August 30 to September 8,2013. Hope you catch up with the promo before it ends. Good luck!